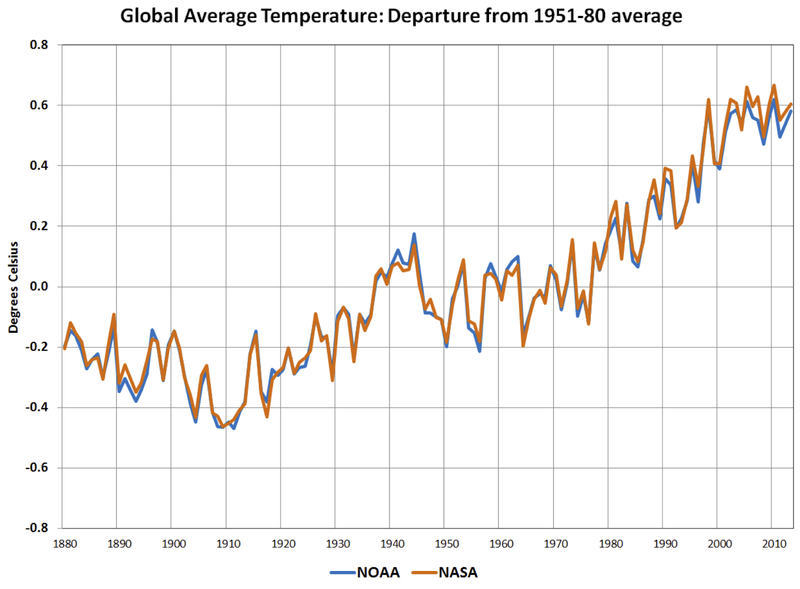 Global temperatures for the past 125 years. It's getting hot! The word in Washington lately is that Senator Ted Cruz–who just announced that he’s running for President–is supposed to be a very smart guy. Some of this comes from Harvard Law professor Alan Dershowitz, who said last year that Cruz was “clearly among the top students” at the prestigious Harvard Law School. Dershowitz is very liberal, while Cruz is very conservative, so one assumes that Dershowitz wouldn't say this if it weren't true. Perhaps Cruz was an excellent law student. But when it comes to science, Cruz is no whiz kid. On the contrary, he seems to be woefully ignorant. We know this because despite his lack of expertise, he doesn’t hesitate to make sweeping pronouncements about scientific matters. Cruz managed to get at least two things wrong in a single sentence here. First, Galileo did not become famous for arguing against flat-Earthers: he argued that the Earth revolved around the sun (the heliocentric model of the solar system) rather than the sun revolving around the earth (the geocentric or Ptolemaic model, after the Greek philosopher Ptolemy). Second, Galileo was not a denialist, nor was he called one. He was not denying a vast array of scientific data to make his point–just the opposite, in fact. The data showed that the Earth and other planets revolved around the sun, and the Catholic church (among other institutions) didn’t want to believe it, and therefore they forced him to recant. The Church didn't call Galileo a "denier." Cruz's statement is not just wrong: it's also arrogant. Cruz is comparing himself to Galileo, one of the greatest scientists in history, as if he (Cruz) were making a brave scientific stand against a dogmatic opponent. This is the crux of the Galileo gambit: the speaker claims to take a heroic stand against a powerful foe while defending the truth. Sorry, Senator Cruz: you’re no Galileo. Not even a little bit. "And many of the alarmists on global warming, they’ve got a problem cause the science doesn’t back them up. And in particular, satellite data demonstrate for the last 17 years, there’s been zero warming. None whatsoever." There’s no mystery about why Cruz and others deny global warming: the oil and coal industries have conducted a vigorous campaign for years now, primarily targeting Republicans, to cast doubt on the science. The reason is simple: fossil-fuel companies are worried that if we take global warming seriously, we might burn less fossil fuel. Their lobbying campaign is working: Cruz has certainly fallen into line. Meanwhile, coastal areas are fighting rising sea levels, and the Arctic and Antarctic are melting. Lobbying might change the minds of politicians, but the planet doesn't care. Now let’s look at the second bit of dodgy science that Senator Cruz endorsed this week. He announced his candidacy at Liberty University, a Christian fundamentalist college in Virginia that was founded by Jerry Falwell, an evangelical Southern Baptist minister. Liberty University’s Center for Creation Studies teaches students that the the Earth is only a few thousand years old and that all species were placed here by an all-powerful god, exactly as described in the Bible. Not surprisingly, students and faculty at Liberty University deny the facts of evolution. To a scientist, Cruz's appearance at Liberty University is an in-your-face endorsement of creationism. I should be clear that Ted Cruz didn’t explicitly embrace creationism and deny evolution when he announced his candidacy, but he did choose Liberty University, and he must know its views about evolution. I wrote to Senator Cruz to see if he believed in young-Earth creationism, or if he believed that species evolved over millions of years, as science has demonstrated. He didn’t reply. Virtually all of modern biology and medicine has its basis in evolution. No serious scientist disputes that evolution is by far the best explanation for the species around us, and for a thousand other phenomena that scientists study every day. The debate about the fact of evolution is long over. As a scientist, I find it just embarrassing to have prominent U.S. politicians publicly deny evolution. Actually, I suspect that Ted Cruz isn’t really a creationist. I find it hard to believe that a guy who went to Princeton and Harvard, and apparently did quite well at both schools, can really believe the Earth was created 4,000 years ago. I also wonder if he truly believes that the world's leading climate scientists are just making stuff up about the Earth warming. Maybe he’s just pandering to his right-wing audience and his campaign donors. Do politicians need to make decisions about science? Of course they do. But science can be incredibly complex and specialized. A good president (or prime minister, or governor) will identify experts–independent ones, without conflicts of interest–and seek their advice. Ted Cruz is no scientist, as his recent comments demonstrate, but I predict he won't be the only U.S. presidential candidate to make misguided remarks about science. Perhaps Cruz being the "Cruz was “clearly among the top students” suggests that Harvard need to raise its entry standards? My complaint. "The data showed that the Earth and other planets revolved around the sun, and the Catholic church (among other institutions) didn’t want to believe it, and therefore they forced him to recant", has very little relationship to reality. The church did not really care all that much about the actual issue. It was peripheral to main dogma and could easily have been integrated into normal accepted knowledge. That's what the theologians were for. Among the real problems was that, while Galileo was correct (more or less), that the earth circled the sun, his theory did not work. Among other things, it predicted one tide a day. Galileo had spent his entire life in Italy and had never lived by the sea; he probably did not realise the problem. Church officials who had grown up along the Atlantic coast probably started laughing hysterically when they heard the theory. From a political view, his book on the topic was taken as a personal libel by the increasingly paranoid Pope of the time who thought the character Simplissimus was a caricature of him. So the Galileo story is one of caution but not religious bigotry as usually portrayed . When advancing novel scientific ideas, particularly in despotic, theocratic state, 1) make sure the theory works, 2) do not, even accidental, slander or libel the despotic, and paranoid chief of state. A true fountain-of-youth drug combo?